Stone Sour is an American hard rock band that hails from Los Angeles, California. The band was formed in 1992 by vocalist Corey Taylor and drummer Joel Ekman. The band started by playing in clubs and bars. The early band disbanded in 1997 when Corey Taylor decided to join SlipKnot. 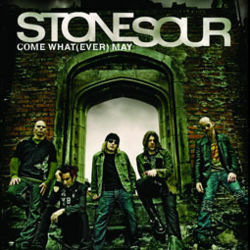 The band was revived in 2000 when Corey Taylor was approached by fellow Stone Sour band member and began to create songs. Both realized that the songs they were making was good enough to record and decided to bring the band together again. It was until August of 2002 that the band was able to release their self-titled debut album. Fueled by the single Bother which was also featured in the soundtrack of the movie Spider-Man, the album went on to reach Gold status. The band then toured for six months before taking a break as Taylor and other fellow band member James Root went back to join with SlipKnot. In 2006, the band again got together and released their second album Come What(ever) May. The band then promoted up the album by going on tour with other established bands. The album debuted at number four on the Billboard Charts, selling 80,000 copies on its initial week. The name of the band was taken from a name of an alcoholic drink made from one part whiskey, one part orange juice, with a splash of sour mix.